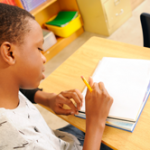 Writing a journal is a familiar literacy experience for many students in the classroom. Reflecting on the sometimes uninspired efforts of students and her own experiences of journal keeping, teacher and writer Jenny Feely argues that journals should be as useful to student writers as they are to professional writers. For students, journals should provide opportunities for writing imaginatively and be useful resources to inform their other writing.